Recently, the National Transportation Safety Board released the complete accident report on the Enbridge pipeline rupture and crude oil spill that occurred on July 25, 2010 near Marshall, Mich. To date, the spill has cost Enbridge more than $800 million to clean up, making it the most expensive onshore oil spill in American history. Enbridge operators had plenty opportunities to lessen the magnitude of the spill by simply following rules that were in place. Instead, 840,000 gallons of crude oil were released into the environment over 17 hours. When a pipeline spill occurs, the time between discovery and response is most critical. 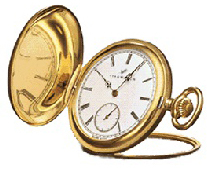 In medicine, they refer to the “golden hour” as the critical time when decisions and actions can mean the difference between life and death. Enbridge’s golden hour spanned over 17 hours. It lasted from when the first leak alarm went off, when the operator decided to ignore warnings and pump even more oil through the rupture — not once, but twice — making the spill exponentially worse. Company protocols required operators to check the validity of the alarms. Company officials did the opposite, ignoring them and pumping more than 81 percent of the total oil spill through the pipeline. The “golden hour” was tarnished the moment rules were ignored and warnings were not heeded. What if Enbridge operators listened to the initial alarms? What if effective planning was in place and cleanup crews arrived quickly on site? What if Enbridge took advantage of the “golden hour” and did everything in their power to effectively triage the problems with the pipeline? To the Marshall community and the surrounding environment, there was nothing golden about the dark hours that ticked by as the crude oil spilled into their waterways, impacting the lives of the community residents and their environment. Enbridge’s botched oil spill response evidenced a lack of preparation, planning and professionalism. When accidents occur, the manner in which an organization has prepared and effectively carries out their plan showcases responsibility. The “golden hour” should never become the darkest hour. Over the past three days here in Oskosh, I met with many dedicated general aviation pilots and enthusiasts. 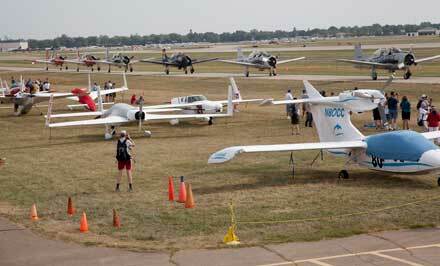 They do not call EAA AirVenture “The World’s Greatest Aviation Celebration” for no reason. In the middle of the excitement, the NTSB also brought a message of safety and vigilance to the attendees. This morning, I met with incredible women who are a key part of the aviation community. I enjoyed breakfast and a lively conversation with Women in Aviation International. I had the opportunity to spend time with Dr. Peggy Chabrian, the president and founder, who continues to provide leadership to both women currently in the industry as well the next generation of women in aviation. Before leaving AirVenture, I had the opportunity to visit our NTSB booth at the Federal pavilion one last time. I am grateful to the NTSB staff who volunteered to come to AirVenture to provide information to the thousands of aviation enthusiasts. General Aviation safety is on the Board’s Most Wanted List and one of the things we learned during two recent forums on the topic was how important it is to reach out to pilots about our safety recommendations and foster a strong safety culture in the sky and on the ground. 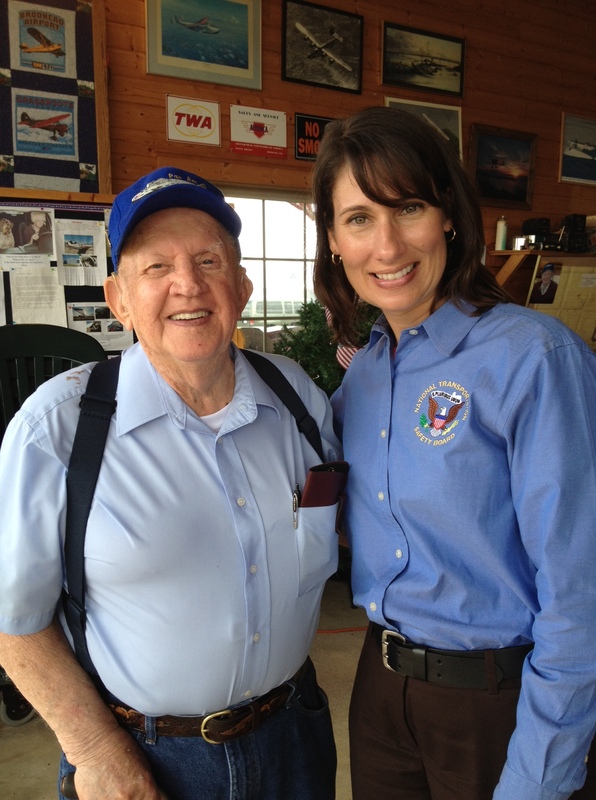 This afternoon, I visited with the Central County Flyers Association in Iola, Wisconsin. I joined the group at their weekly lunch in their hangar at Central County Airport. It was great to meet local legend and aviation pioneer, Paul Johns as well as the scores of attendees to discuss the NTSBs work in aviation safety. I would like to thank EAA and thousands of volunteers for putting on another great AirVenture event. As you can tell from the last couple of blog posts, the NTSB staff and I had a productive time out here at Oshkosh. For pictures and more information on the event, visit http://www.ntsb.gov/news/events/2012/oshkosh_wi/index.html. War birds preparing for take off during the air show at AirVenture 2012. Today was another great day at EAA AirVenture! I started the day by giving an overview of the recent study the NTSB did on the safety of experimental amateur-built aircraft, or E-AB. When looking at data over the last 10 years, the E-AB accident rate has consistently been four times higher than certificated GA aircraft operated in similar conditions. We conducted the study to better understand accident causes and identify ways to reduce the number of accidents. You can read the highlights of the study here. Our analysis showed that powerplant failures and loss of control in flight are the most common E-AB aircraft accidents by a large margin for both new and used aircraft. And we found that a higher proportion of E-AB accidents occur early in the aircraft’s operational life – 10% on the first flight of a new or used E-AB during 2011. I appreciated the pilots that came to hear the presentation and offered a number of very thoughtful questions and comments. We discussed opportunities to improve the phase 1 test period and to enhance training in a new aircraft type. In addition, we had a great discussion about how industry associations and type clubs are really stepping up outreach and mentoring of E-AB builders and buyers. Dr. Loren Groff, Dr. Vern Ellingstad and Chairman Hersman field questions about the NTSB EAB Safety Study. Later in the day I got an in-depth briefing on air show operations and safety and got to see the results of all the intensive planning and coordination with the afternoon air show performance. It was particularly fun to watch Sean Tucker perform in his Oracle Challenger bi-plane since he had participated in our hearing on Air Race and Air Show Safety earlier this year. Throughout the day I visited various exhibits, met with manufacturers and learning about their efforts to improve GA safety. I thought I covered a lot of ground last year, but this year has been even better. I’m signing off now – so I can get prepared for my last day here in Oshkosh tomorrow. With just three more days of AirVenture 2012, don’t forget to check out the NTSB’s EAA AirVenture 2012 activities. What a day it’s been at EAA AirVenture! I started the day with a fascinating behind-the-scenes look at all the work that goes into assuring safety for the 10,000 aircraft that fly in and out of Wittman Regional Airport as well as for overseeing the safe operations for the dozens of air show performers. Many thanks to Jim DiMatteo, Vice President of AirVenture Features and Attractions for the clear explanations. Chairman Hersman talks about the NTSB with a visitor to the NTSB exhibit booth. Later, I had a great time talking with numerous aviation enthusiasts at AirVenture’s first-ever Meet the NTSB Chairman forum. We had a lively discussion and I hope the attendees gained a better understanding of the NTSB’s roles and responsibilities. I appreciated hearing about the issues facing the general aviation community and the candid exchange during the Q & A session. A highlight of my day was a visit to KidVenture, which is a huge hands-on demonstration area and immense effort by scores of dedicated volunteers to share the excitement of aviation with our next generation. Or, with the Olympics coming up, maybe I should say to pass the torch of aviation enthusiasm! When KidVenture started they only had 2,000 visitors that first year. Last year, it was up to 25,000 young visitors and from what I saw today, I expect that number will continue to climb. A couple of young aviation enthusiasts showed Chairman Hersman the ropes at KidVenture. After KidVenture I spent time at the NTSB booth at the Federal Pavilion. 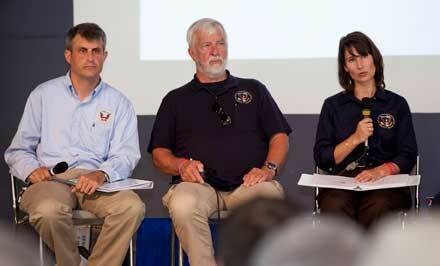 You can find out more about the range of NTSB activities and involvement at EAA AirVenture 2012 on this website. Tomorrow, I’ve got another busy day. In the morning, at 10:00 at the Honda Pavilion, I’ll be providing an overview of the NTSB’s recent study on the safety of experimental amateur-built aircraft. I am also looking forward to spending some time with the Air Boss to see what it takes to coordinate a major air show. As I work on this entry, I am getting ready for my trip to Oshkosh, Wis., home of EAA AirVenture, which every time this year is one of the largest gatherings of aviation enthusiasts. I’m told AirVenture attracts about a half million people from more than 60 countries. Many people —about 10,000 — fly their own aircraft to AirVenture, making Oshkosh’s Wittman Regional Airport, for a few days at least, the world’s busiest airport. I’m excited about my AirVenture schedule this year. Since air show safety has been on the NTSB’s agenda this past year, I’m looking forward to meeting EAA’s safety operations program manager as well as FAA’s national air show coordinator. My schedule is full and growing, but what I enjoy most is meeting and talking with GA pilots. The NTSB takes advantage of this annual gathering to take our safety message directly to the people who can benefit from some very hard-learned safety lessons. A number of NTSB employees will be at AirVenture. You can talk with our air safety investigators at our exhibit in the Federal Pavilion, hear about our investigations and findings at a number of safety seminars, and I’m hosting two sessions as well — Meet the NTSB Chairman on Wednesday at 11:30 a.m. in the Honda Pavilion and a session on our recent safety study of experimental amateur-built aircraft on Thursday at 10:00 a.m., also at the Honda Pavilion. And, as I did last year, I’ll be talking with EAA Radio, another one of the great activities that the many volunteers make possible at AirVenture each year. If you’re at AirVenture and see me, stop and introduce yourself. I hope you enjoy your visit as much as I know I will! 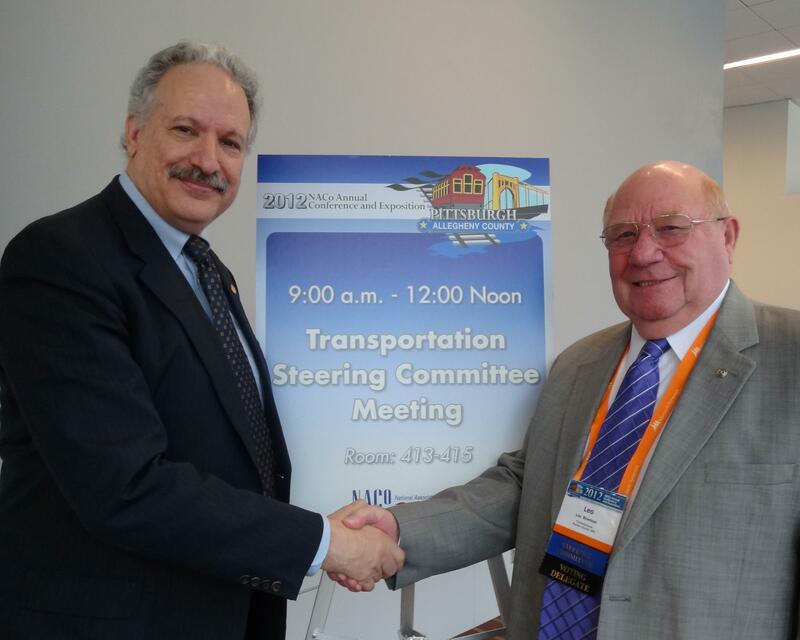 NTSB Member Mark R. Rosekind with Benton County Commissioner Leo Bowman, Chairman of the National Association of Counties’ Transportation Steering Committee after Member Rosekind’s remarks at the annual conference. As trends go, state and local governments are becoming increasingly responsible for many aspects of transportation safety. This includes the 3,077 counties across the United States. On Saturday, I spoke at the National Association of Counties’ (NACo) 77th Annual Conference in Pittsburgh about the NTSB, its investigation process, on-scene activities after an accident, and ways in which to make travel safer in counties across America. It was a great opportunity to familiarize a broad and important cross-section of the nation’s local leaders with the NTSB should a transportation tragedy happen in their area. NACo is the only national organization representing county government and its meetings provide a unique forum for over 2,000 elected officials to learn more about organizations and issues affecting their counties, network with colleagues, and educate themselves about innovations across the country. Although counties have an array of various responsibilities depending on the state they are in, some duties are universal, especially enhancing transportation safety. While it is the NTSB’s mission to make safety recommendations to prevent accidents from recurring, local leaders know that being prepared for the possibility of a major transportation accident in their county is critical. I addressed NACo’s Transportation Steering Committee, charged with guiding the organization on diverse matters related to transportation safety; project development and financing; comprehensive transportation planning; highways; public transit; airports; railroads; waterways; and research and development of new modes of transportation. An area that I highlighted was the integrity of our nation’s infrastructure using pipeline safety as an example and focusing on the PG&E San Bruno, California, pipeline explosion and Enbridge Marshall, MIchigan, oil spill. One concrete action for participants: ensure that their first responders know where pipelines are located in their county, what is transported through them, and contacts/actions needed to address a problem. It was clear from my discussion with NACo members and staff that all counties are feeling the pressure to fill funding gaps, especially in the area of transportation safety. As state and local governments continue efforts to enhance transportation safety, their interests directly intersect the NTSB and its mission. By increasing dialogue, partnerships, and information sharing with community leaders in counties, towns, and cities, everyone will reap tremendous long-term benefits for making America a safer place to travel. 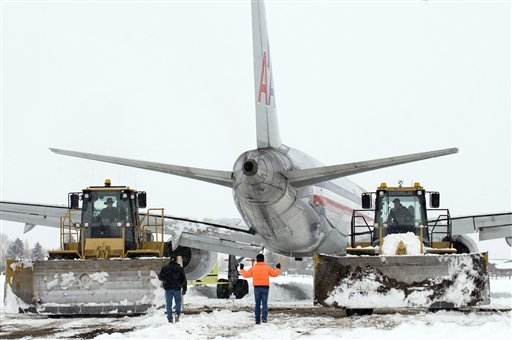 In June, the Board deliberated a runway overrun involving an American Airlines B-757 at Jackson Hole, WY. Fortunately, about the only thing hurt during the accident were the egos of the two pilots. Setting the stage for the incident were two separate and unrelated mechanical issues: the speedbrake did not automatically deploy, and the thrust reversers did not initially deploy when commanded. Although the speedbrake could have been deployed manually, this was not done – perhaps because both pilots now were engrossed with trying to deploy the thrust reversers. In essence, he was looking but not seeing. I suspect somewhere in my three decades of flying, I probably made the mistake of looking at something but not really seeing what I thought I was looking at. The NTSB has seen this in other accidents, as well. In the fatal July 2008 runway overrun accident involving a Hawker 800 at Owatonna, MN, the first officer called out “we’re dumped” to indicate the liftdump had deployed upon landing. Although he immediately corrected himself and said “we’re not dumped,” his initial callout was made in anticipation of the liftdump system activating, not by actually verifying it. The NTSB stated “the first officer most likely stated ‘we’re dumped’ as an automatic callout upon landing when he saw the captain move the airbrake handle aft” without actually verifying the deployment of the liftdump system (underlining for emphasis). So, what have we learned from these accidents and incidents? Make sure what you are looking at is actually what you are seeing. What measures can you take to make sure you not falling into the trap of looking but not seeing? Robert L. Sumwalt was sworn in as the 37th Member of the National Transportation Safety Board on August 21, 2006. He is a frequent contributor to the NTSB blog.